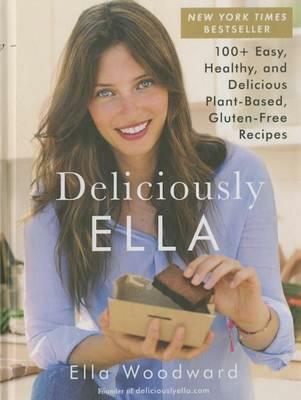 From the founder of the wildly popular food blog Deliciously Ella, 120 plant-based, dairy-free, and gluten-free recipes with gorgeous, full-color photographs that capture the amazing things we can do with natural ingredients. In 2011, nineteen-year-old Ella Woodward was diagnosed with a rare illness that left her bed-ridden, in chronic pain, and plagued by heart palpitations and headaches. When conventional medicine failed her, Ella decided to change her diet. She gave up meat, gluten, dairy, sugar, and anything processed–and the effects were immediate: her symptoms disappeared, her energy returned, and she was able to go off all her medication. A self-confessed sweet tooth, Ella taught herself how to make delicious, plant-based meals that delight the palette and improve overall well-being. Deliciously Ella is an essential, how-to guide to clean, plant-based eating, taking you through the best ingredients and methods for preparing easy, exciting meals. This is not a diet–it’s about creating a new mindset that embraces fantastic food. From sweet potato brownies to silky chocolate mousse and roasted butternut squash risotto and homemade fries and ketchup, Ella shares 100 brand-new recipes and twenty classics in her signature, elegant style. Packed with vivid photos and simple, foolproof instructions, Deliciously Ella provides a foundation for a pure, unprocessed, unrefined diet, so you can look and feel better while enjoying great food.